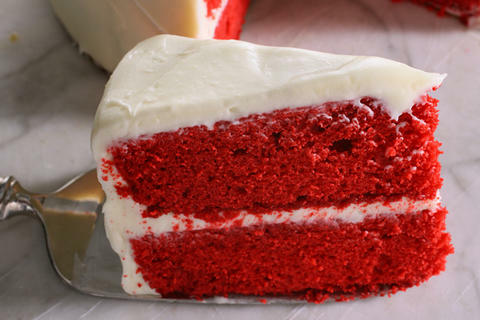 Best Red Velvet Cake Recipe. Ever. 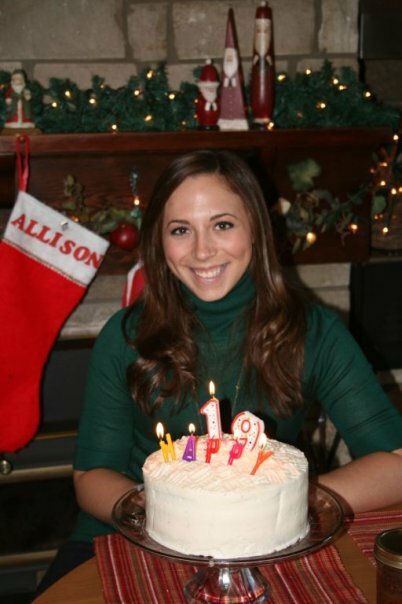 Here I am goofing around with the fun decorations my mom made to go on my birthday cake last year. We make it a double layer cake – this means more icing! 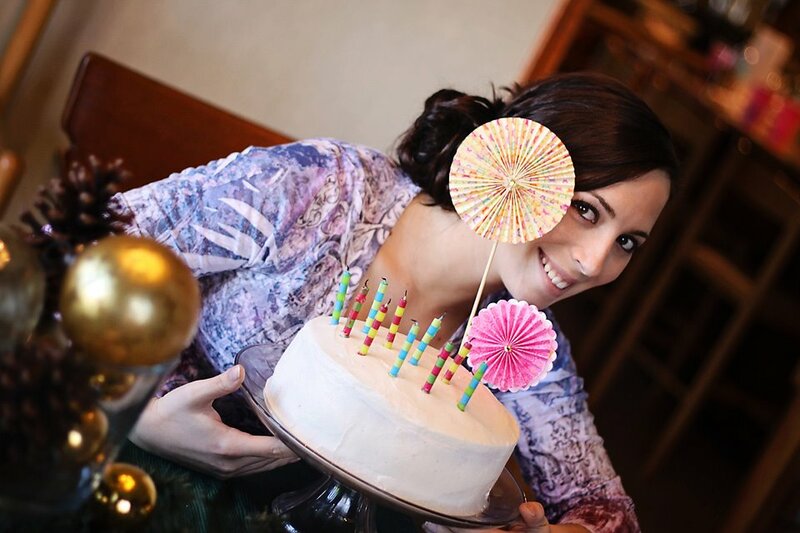 See technique on how to create this pretty double layer cake below. My birthday is on Christmas so the red is always a festive color to go along with the season. 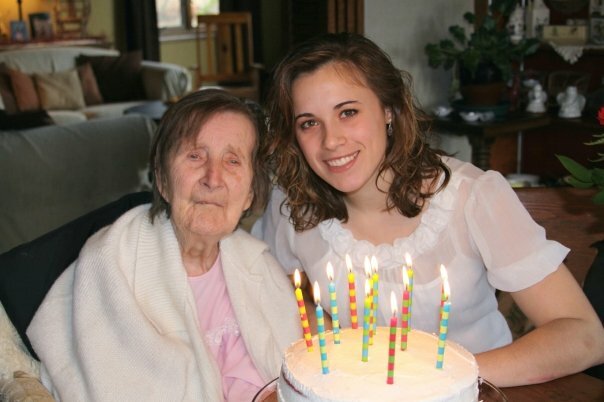 We also make it on Thanksgiving because my sister’s birthday is around that time and also because my great Grannie Griffin (pictured here – she lived to be 97) also loved it and this is her recipe. Anyway, I was asked to share this recipe with a fellow blogger and lover of all food, Lauren, of HallNesting so I thought I would just share it with everyone! While we typically make this for Christmas, since it is red, it could totally work for Valentine’s day as well if you want to make a special treat for someone! Here is the recipe! I will apologize in advance for not taking pictures of all these steps – this was a spur of the moment blog so I had to pull from the old pictures I had. I’ll try to update it though next time we make this! NOTE: If you want to make this into a double layer cake, spray two 9 inch cake pans with non-stick spray and then cut out circles of wax paper to line the bottom of each pan. This makes the process of removing them from the pan much easier and your cake won’t fall apart. Cook milk and flour until thick. (Heat slowly and stir constantly to make sure not to scald your milk. ) Then let cool. (**See note below**) While milk/flour mixture is cooling, cream together sugar, Crisco, and vanilla in mixer. Once milk/flour mixture is cool, add it to Crisco/sugar mixture. Beat until light and fluffy. As mentioned, we make this a double layer cake so after cakes are cool, run a knife around the edge of the cake pan to loosen it, then use an additional sheet of wax paper and flip the cake upside down onto it, gently pull off the cake pan and wax paper, and use both hands, one on top and bottom of the cake, to flip it back right side up. Make sense? To ice the cake, we put a layer of icing in between the two layers, then ice all around the outside and top of the cake to finish. My sister is the best at this technique! I usually place plastic wrap on the surface of the cooked mixture while it cools. 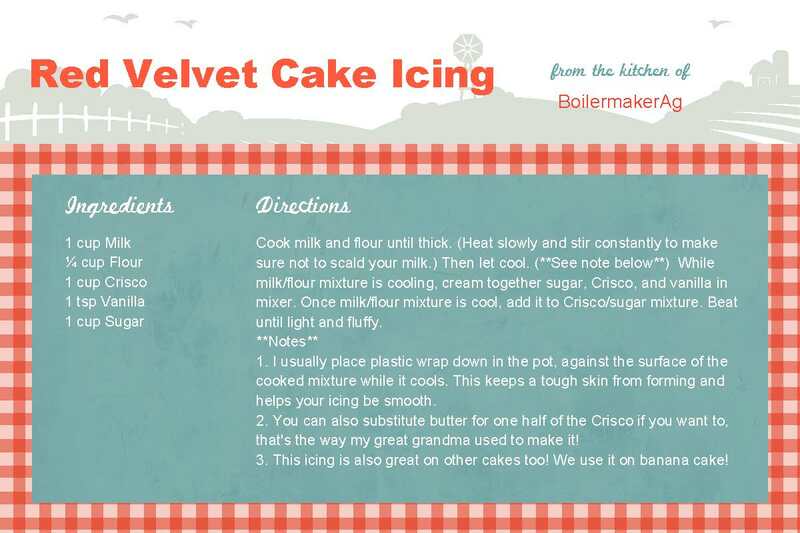 This keeps a tough skin from forming and helps your icing be smooth. This part may be tricky, please ask me if you are confused! You can also substitute butter for one half of the Crisco in the icing if you want to, that’s how my great grandma used to make it! But we like it without butter because it’s a little lighter and fluffier. Up to you though! 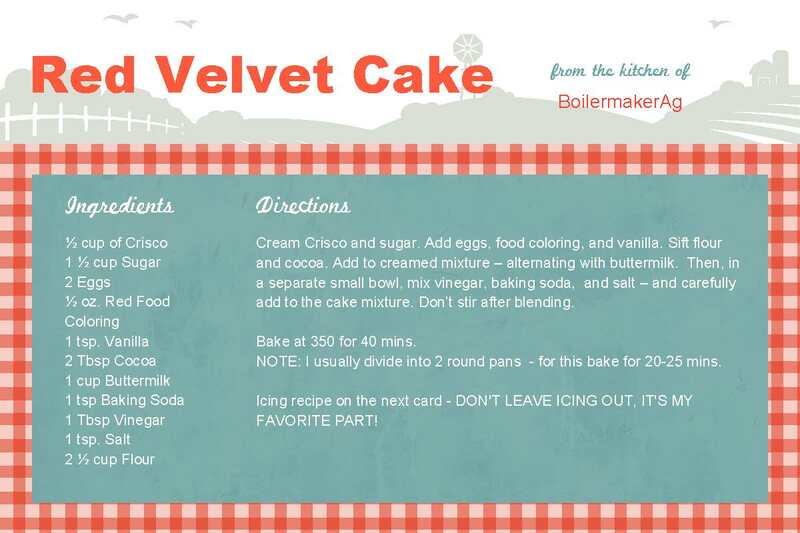 Here are some printable recipe cards if you would like to save this recipe for your collection! 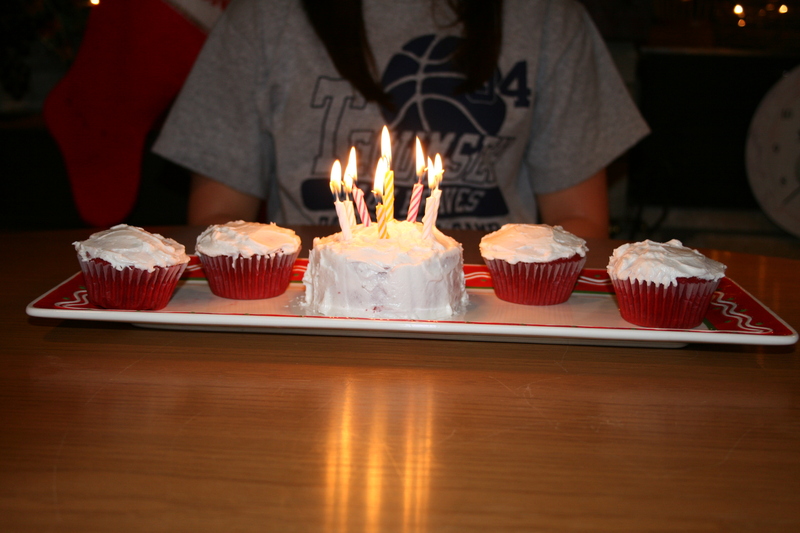 Is red velvet cake a tradition in any of your families? I’d love to hear about it! Also, if you try this recipe, let me know how it turns out! I can also help with any questions that might come up! ENJOY!